Wildlife strikes in Australian aviation have increased significantly over the past two years and continue to pose a safety risk to aircraft operators, according to a new report released by the ATSB. The report, which provides aviation birdstrike and animal strike occurrence data over ten years, shows that there were 1,977 birdstrikes and 53 ground-based animal strikes in 2015. Most of these occurrences involved high capacity air transport aircraft. The wildlife strike rate for six of the ten major airports increased markedly in the past two years, relative to the ten-year average. The largest increase in the rate of birdstrikes was at Cairns, Canberra, Darwin, Gold Coast and Sydney. Bats and flying foxes, swallows and martins, kites, and lapwings and plovers were the most commonly struck type of flying animal. Ground-based animal strikes were relatively rare. The most common ground animals struck by aircraft were hares and rabbits, kangaroos, wallabies, and dogs and foxes. Damaging animal strikes mostly involved kangaroos, wallabies and livestock. The report also estimates that 766 kg of flying animals were struck per year by aircraft in Australia. 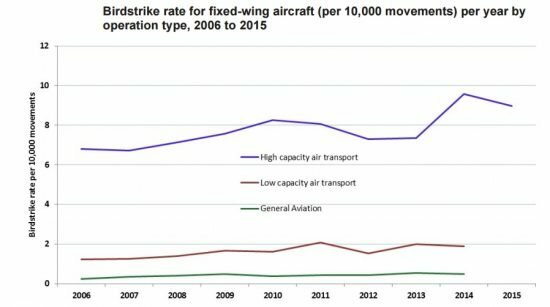 Additionally, for every 1 kg increase in animal mass, the likelihood of a birdstrike causing damage increases by approximately 12.5%. Although the vast majority of wildlife strikes do not result in any damage or operational consequence, they still pose a serious safety risk to aircraft.